Estwings Ultra Series Solid Steel Hammers are engineered lighter and stronger. The sleek new profile make them lighter and areodynamic. 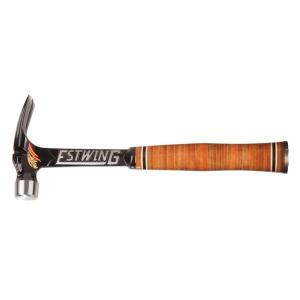 Estwing hammers are forged in one piece out of fine tool steel for long life and dependability. No welds. No joints that can fail. The grip is a beautiful genuine leather. Tbook.com crawls the web to find the best prices and availability on Estwing and related Tools and Hardware products like Estwing 19 oz. Leather Gripped Ultra Framing Hammer with Milled Face. For this page, related items include products we find that match the following keywords: "Estwing" at our vendor partner Home Depot. Estwing 19 oz. Leather Gripped Ultra Framing Hammer with Milled Face is one of 156 Estwing and related products listed in the Tools and Hardware section of Tbook.com If you have any questions on this product, please give us a call at 734-971-1210 during the hours of 9am - 5pm EST for assistance. Thank you for shopping at Tbook.com, the Internet Department Store!